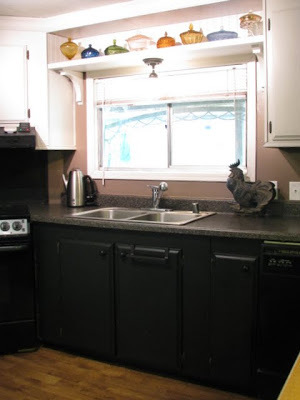 This affordable mobile home kitchen remodel will surely inspire you. 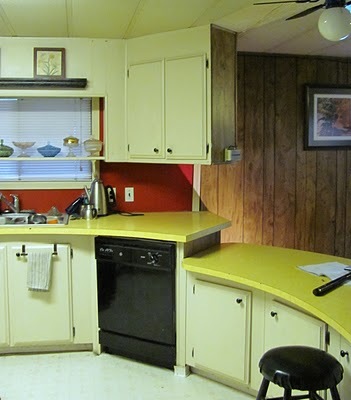 This home is a late 70’s model and had an all original kitchen complete with curved counter and harvest gold everywhere. Then comes a talented and creative soul that turned it into a gorgeous and modern kitchen fit for a queen. I found this on a wonderful site called Blue Roof Cabin. The creator of the site is Mimi and she is a re-purposing, crafting and creative maven that puts Martha Stewart to shame. Yes, I’m being serious. Her talent is immense and obvious. Of course, I’m the type that would rather see someone re-purpose salvaged items than using $55 ribbon spools any day, but that’s just me. Mimi’s sister is the mobile homeowner and now the proud new owner of a spectacular kitchen. If you want to read about all the juicy details please go to The Blue Roof Cabin. Caution: You will be there all day reading about Mimi’s numerous and amazing low-cost projects so go ahead and grab a snack and drink. Don’t forget to bookmark it. Here’s the home before the transformation. 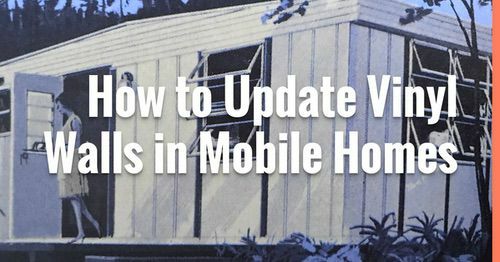 The curved bar is very indicative of the era of mobile home design. The mid to late 70’s was a time of great design transition that went from the retro mod (a cleaner more colorful style) of the 60’s to the warm tones and dark style of the 70’s. 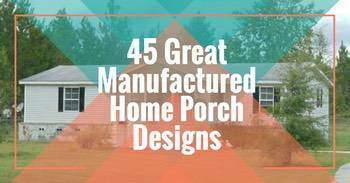 There were some very well-known manufactured home designers during that time. They used storage advantageously and intelligently. Some homes were still produced with real wood in cabinetry and even walls and paneling (though some manufacturers used a glued wood product that was much sturdier and long lasting than the later model’s chipboard). Since they used ‘glued’ wood, demolition is usually a bit difficult. Mimi noticed that as well. Once the demolition was finished Mimi began the designing and building. 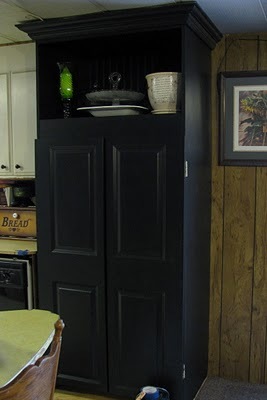 She built a custom pantry cabinet that went from floor to ceiling out of 24″ plywood so that she only had to cut the vertical lines and trimmed it with wide crown molding. Using floor to ceiling ‘built-ins’ ads height and gives the illusion of taller ceilings. It’s a great trick for low ceilings so typical in mobile homes. The next piece to be built was the island. Mimi states that she initially had plans to just build the diameter and add a counter. 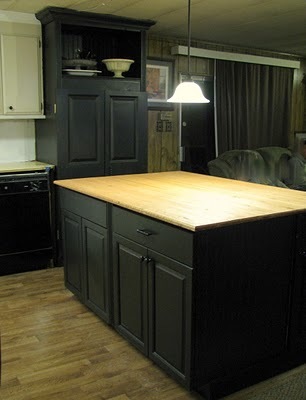 Luckily, she happened upon a few free cabinets and was able to retrofit them into a complete L-shaped island. Since their budget for this remodel was very low (she wrote it was non-existent). With a little customizing she was able to build a beautiful island that actually looks just like the ones that are sold for thousands of dollars. It’s an exceptionally well thought out and well-executed design. Pine boarding that was stained and sealed completes the island. New flooring and paint finished the remodel. 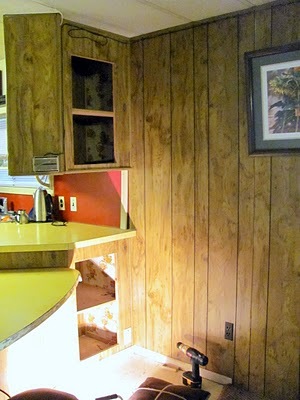 The shelf above the sink is made from an old hollow door. Since the area was already wired for a light, the door allowed Mimi to hide the wiring in the back of the door. The width of the door made the shelf seem like a built in as well. This is the kind of ingenuity that blows me away. Who would think to use a door as a shelf? I love it! 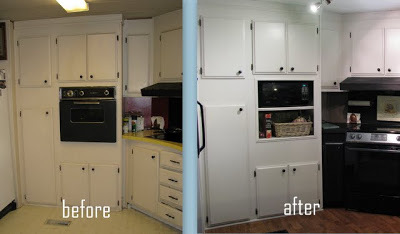 This is exactly the kind of remodels I appreciate the most. Low budget and high creativity allow you to really customize the home and use ingenious ideas to get the look you’re going for. Anyone can pay $20,000 to a contractor and get a gorgeous kitchen but not everyone can take a few hundred dollars (if that) and make it look as if it cost 20 grand. 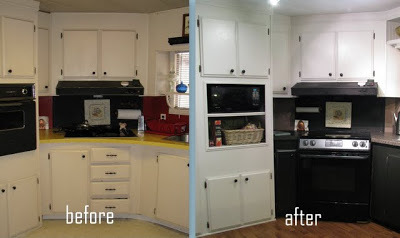 This talented lady deserves applause and medals for this mobile home kitchen remodel. 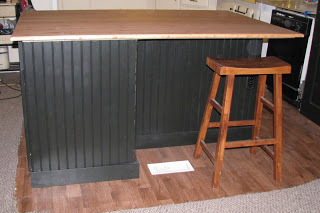 ALL photos are the property of The Blue Roof Cabin a great blog about re-purposing, re-using and creating beautiful things from salvage. You can find it at www.blueroofcabin.com. Go check it out! 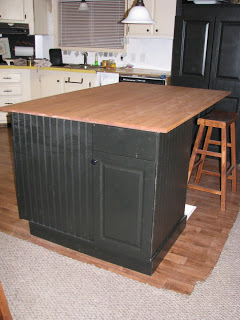 Related: 2 More Great Kitchen Ideas! 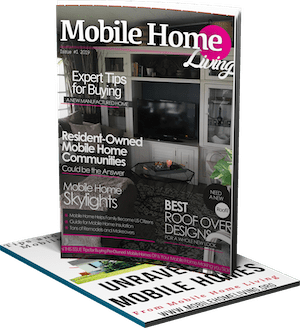 3 Remodeling Ideas To Transform Your Mobile Home Kitchen. 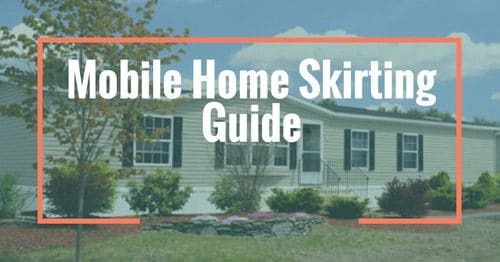 As always, thank you so much for reading Mobile and Manufactured Home Living. I appreciate you being here. I have just purchased a 20 year old mobile home in a beautiful part of the Florida Panhandle. While we were hit hard by hurricaine Michael, thankfully I just had a few downed trees. I am starting with the flooring and redoing the entire home. Thank you for the great ideas. 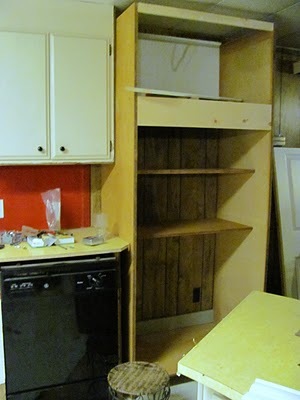 I do not want to spend $$ on cabinets so I will have to be very resourseful. I will be looking for ideas and you have some very good ones. I will be looking at Mimi’s as well. Thank you!! So glad to hear you fared OK during the hurricane! Man those things are scary! 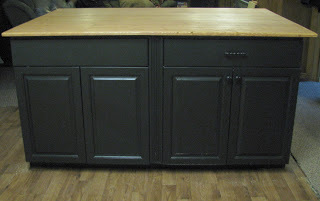 The ReSale shop is great place to find used cabinets! Best of luck! 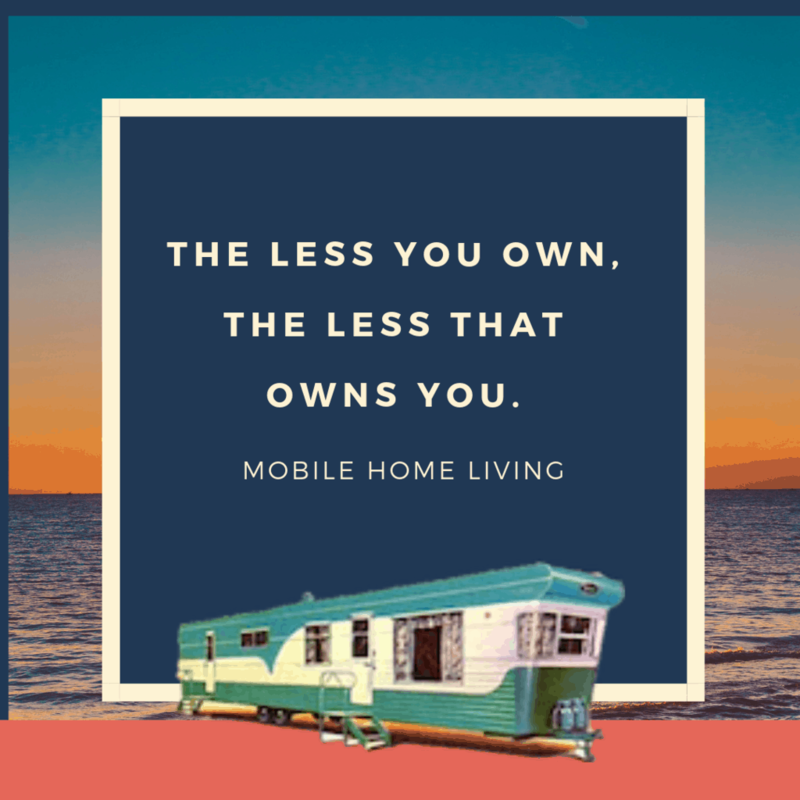 So glad I found this site, I am slowly remodeling my 2006 double wide mobile home! Working on the kitchen now and living room next!! Love that I found this site! 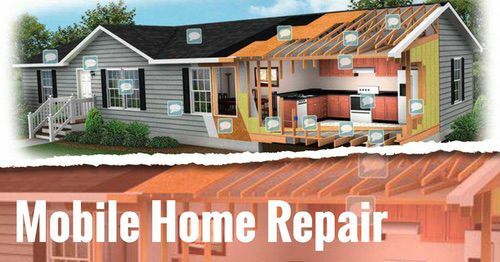 In the next few weeks I’ll begin my own manufactored home remodle and will be referencing this site often!!! Hi Addie! So glad you like it! 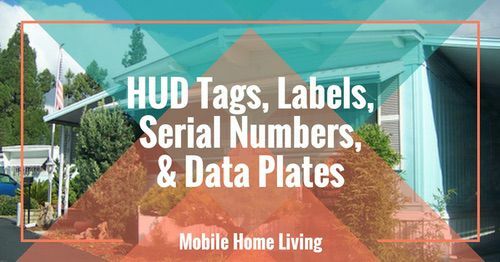 Please considering sharing your home changes – I’d love to feature it here on MHL! Fantastic kitchen remodeling in here! I saw a very good combination before and after remodeling and without any question I just want to say that it’s totally outstanding service and definitely I will look forward to get this service for my own kitchen. Really liked the kitchen remodel and the most important thing that I liked the storage cabinets those they have created in the kitchen. This makes the kitchen clutter free. 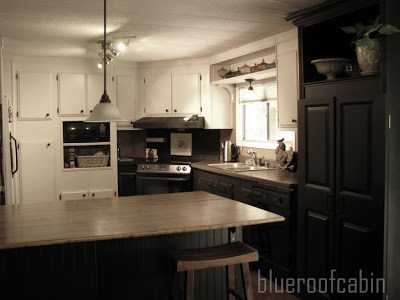 This is wonderful, I was searching some tips for my kitchen remodeling and I am really glad to have everything here in this bog. Thank you very much for your help and useful tips. 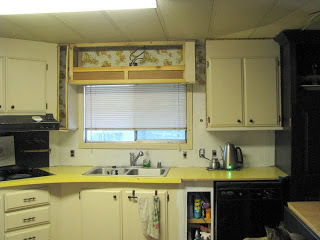 I've been reading Mimi's blog for quite some time but I must have missed the final result of her sis's kitchen. 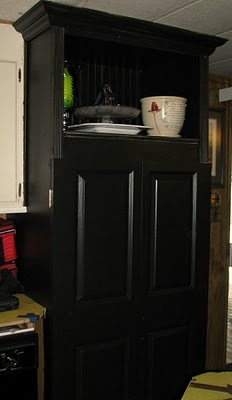 Love the two tone cabinets and black and white scheme, I could move right in and not change a thing. Mimi always takes on a great project with amazing results. Congratulations, Mimi! I love seeing owners of manufactured homes pick up a hammer and saw with no fear. Love the pantry cabinet and what a great idea for over the window! No kidding…anyone can pay lots and get something nice, but I really love and appreciate this kind of creativity! Gorgeous makeover, and the island is just fablulous!